I don’t doubt the magic of Disney World. It’s the only place on Earth that can attract tens of thousands of people every day who are willing to pay hundreds of dollars to walk in hellish heat and among crowds thicker than the Florida humidity only to stand in line for an hour to ride a two-minute roller coaster. People don’t like sitting through a two-minute commercial break on TV. Why would they wait an hour for a ride? Magic is the only explanation. I found myself under the spell of this magic last month, but after a couple of days of breathing Tikerbell’s fairy dust, reality woke me up. The crowds are overwhelming, the lines are horrendous, people are rude, and, well, you get the point. 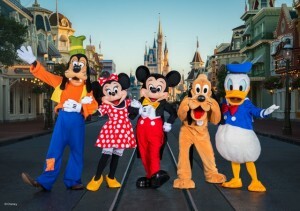 For all the magic and glory of Disney World, I can name quite a few things I could do without when visiting America’s crown jewel of family getaway spots. 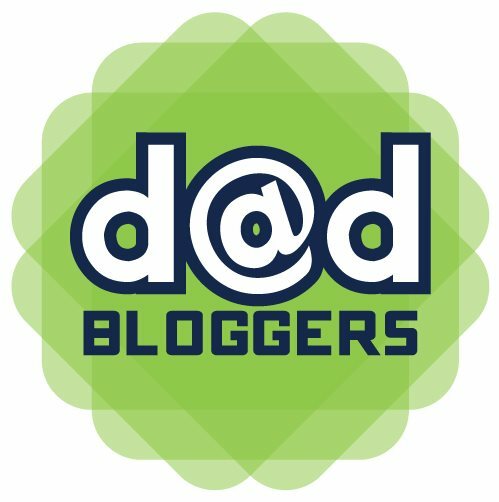 A producer with HuffPost Live emailed me last week to see if I’d participate in a live-streaming discussion on fatherlessness in America. The discussion would revolve around this HuffPost blog post based on a recurring theme on Jay-Z’s newest album: the fears of a fatherless father. Though I know next to nothing about Jay-Z, I know a great deal about growing up fatherless and can relate to the feelings he expresses on his new album. Marc Lamont Hill hosted the discussion with Thabiti Boone, fatherhood adviser to the Allan Houston Foundation, in studio and several panelists joining in via webcams: Derek Phillips, Jeff Zelaya, Mark Anthony Neal, and me. Marc asked a question to start the discussion: How can you be a good dad if you didn’t know your own? Simple question, right? Simple answer, right? Maybe, maybe not. Fatherlessness has many faces, so it’s impossible to answer Marc’s question as simply as he asks it. But before talking about those faces, I can think of a few cases in which kids are better off without their dad. Most of these involve drugs, alcohol, or some sort of other abuse. Without question, children are better off fatherless than with an abusive dad. But the question quickly becomes harder to answer. What if your father left your mother for a younger woman? He obviously didn’t want to stay. Were you better off with or without him? What if your mother kicked your father out because she no longer loves him? Were you better off with or without him? Would it make a difference if she simply fell out of love with him, or she kicked him out because he was lazy, irresponsible, or exhibited some other negative trait? What if your father was present in body, but not in heart and spirit? Let’s say he spent his nights glued to his computer and the weekends playing golf. Were you better off with or without him? Or perhaps the most tragic: What if your father died? Regardless of the face fatherlessness wears in your life, the first step in becoming a good father is acknowledging the trauma fatherlessness causes. 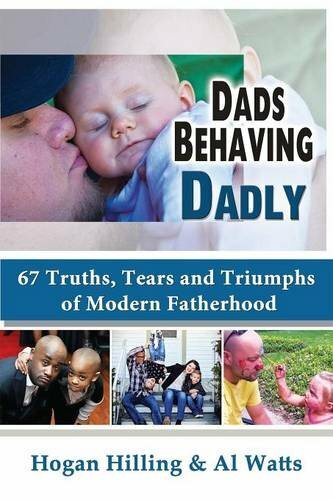 We shouldn’t pretend fathers are dispensable and that fatherlessness is no big deal. Statistics show us otherwise. My own experience growing up fatherless tells me otherwise as well. And my own children tell me otherwise practically every day. My 8-year-old son Gavin did just the other night. I had just returned home well after midnight from a business trip in Chicago, and walked in his room to give him a kiss goodnight. I give him such a kiss every night before I go to bed, and he never stirs. But this night, after I had been away for a few days, Gavin sprung out of bed, yelled “Daddy!” and hugged me like he hadn’t seen me in a year. I know I matter to him, just like all fathers matter to their children. Once you accept that fathers are a necessary part of children’s live, the next step is easy: be there. You don’t have to paint like Picasso to fingerpaint. You don’t have to pitch like Cy Young like to play catch. And you don’t have to swim like Michael Phelps to enjoy a day at the pool. You just have to be there, and you’re well on your way to being a good dad. Finally, if you’re worried about a being a good dad, you have nothing to worry about. All that worry means is that you are aware enough of yourself to question your own shortcomings. Once you know what those shortcomings are, you can deal with them. But believe me, your kids will not see them. All they will see is a father who wants to spend time with his children. And that, my friend, is what it means to be a good dad. I take Celeste and Gavin to the library once a month or so, and allow them to borrow up to two videos each and as many books as they’d like. Of course, I make them responsible for what they borrow. The way I figure it, if they are old enough to keep track of their iPods and Nintendo DSes, they are old enough to keep track of a dozen library books. This arrangement has worked out well given that we never lost a book. 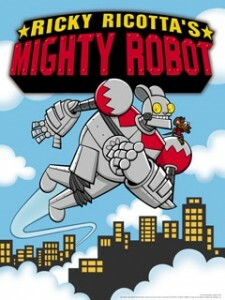 Then “Ricky Ricotta’s Mighty Robot” came into our lives, and challenged Gavin to a wicked game of hide and seek. We didn’t even know the game started until we were at the library checking out the latest round of books. The librarian told us that we couldn’t borrow the books until we paid the fine for the overdue Ricky. I paid the fine, and renewed the book for three weeks so Gavin could search the house for the elusive Ricky. He started the minute we arrived home. He looked in his book bag. Nothing. He went upstairs to search his bedroom. Zip. He looked in the living room. Empty. He looked in the basement, the office, the family room, the car. All for naught. Everywhere Gavin looked, Ricky Ricotta remained a step ahead. “You know what this means, right, Gavin?” I asked. “That it’s lost,” he said. “That’s right. You do,” I said. “OK,” he mumbled and walked away. I can’t remember if Gavin responded or not, but Ricky Ricotta remained hidden for the next three weeks. The library emailed me a reminder a few days before Ricky’s due date, so I asked Gavin if he had any luck finding him. He didn’t. Ricky’s due date came, so I told Gavin to collect his money to pay for the lost book. He dutifully went to his bedroom, took his piggybank down from this dresser, and emptied it on the floor. Gavin counted more than $6 in change, which I traded for some singles, and we went to the library. He was silent on the five-minute drive, and solemn as we walked up to the librarian, his head bowed down to the ground and his hands stuffed in his pockets. Gavin put his $6 on the desk without saying a word. “Well, why don’t I check for you? Sometimes books are placed back on the shelf without being checked back in.” She looked up our account, wrote the title of the book on a piece of paper, and walked back to the juvenile fiction section. Gavin glowed with anticipation at the thought of keeping the $6, as though he had just won the lottery and was dreaming about how many sports cars he could buy. Gavin nearly skipped his way back to the car. “I have $6,” he said proudly. “You’ll need more than $6 for a game,” I said. He thought about it a moment then shrugged. “That Ricky Ricotta plays a mean game of hide and seek,” I said. I wish I remembered Gavin’s first word. He learned to talk at some point in his six years on this planet, but I cannot remember the first word he uttered. Nor can I remember his first steps, his first tooth, or even his first haircut. His first day of school is a shell of a memory, and the first time he felt the sand under his feet is as elusive as the sand itself washing away with the tide. But I remember his first cuss word. He blurted it out just the other morning. “I know the B-word, Daddy,” he said with pride, as though he had just returned from the moon on a spaceship he built with Lego bricks. But he didn’t just say it. He said it with feeling, as though he was one of the stars on “Mob Wives” and was talking to a waitress who showed too much interest in her man. I didn’t expect the word to come out of his mouth, nor did I expect him to say it with such gusto. After all, this is the kid who says he loves me “the mostest,” but his diction was clear and tone left no doubt that my 6-year-old son had learned his first cuss word. I knew this day would come. Though Karen and I don’t cuss as part of our everyday language, kids often learn the more colorful words of the English language on the playground when adult mouths and ears are nowhere to be seen. Him learning to cuss was inevitable, but I still don’t want him dropping F-bombs from the merry-go-round. “You’re right, Gavin, that’s the B-word, but I don’t want you to say it,” I told him. “But I don’t even know what it means,” he said. I took a deep breath, sat down, pulled him aside, and spoke to him plainly. As he walked away, I thought briefly about the differences between boys and girls, or at least between him and his older sister. I’ve run across this same issue before with Celeste, but she would not repeat the words she had heard. In fact, Celeste holds on to the belief that the S-word is “stupid” and the D-word is “dumb.” Part of me thinks Gavin knows different, but I don’t want to ask him. No need to teach him otherwise if I’m wrong. But I didn’t I say “truck.” I said, well, you know. Yep, Gavin’s got nothing on me. This is a repost of a column that ran in The Gazette on Sept. 29, 2011. I’m sure Gavin has learned plenty of other colorful words since this column first appeared, but he doesn’t repeat them around me. I don’t expect my cat to bark. At least, part of me thinks that’s what he thinks when he looks at me, but I don’t expect him to do anything beyond meow softly and go back to sleep. He might squint his eyes at me, but he just as likely might not. Universal Studios was a universal flop for both Celeste and Gavin three years ago. Either way, I don’t expect Obi to be anything other than a 12-year-old house cat who sleeps most of the day and paws at me in the middle of the night if I leave the bedroom door open. I mention this to remind myself that I need to have reasonable expectations of people, including children and especially mine. After all, I don’t expect my cat to bark, so why should I expect my children to be anyone other than who they are or to like anything they don’t? 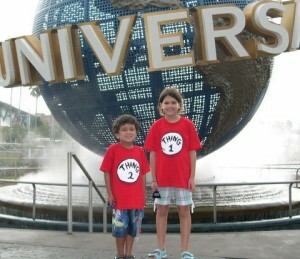 Karen and I took the kids to Universal Studios in Florida last month, and I expected them to love it. Gavin loves superheroes, and Universal Studios is a magnet for those who can fly like a bird, climb like a spider, and run like lightning — all while looking fairly decent in tights. And Celeste had a blast on the rides at Disney World last year, so I expected her to have as much fun this year on the rides at Universal Studios. Both places are tailored for families, so if they liked one, why wouldn’t they like the other? They found plenty of reasons. Celeste and Gavin were underwhelmed by the attractions at Universal Studios, and ready to flee the parks for the hotel swimming pool by 2 p.m. each of the three days we were there. I was as disappointed in their lack of enthusiasm for the parks as they were in the parks, but I can blame no one but me. I expected them to like it, and they did not meet my expectations. They didn’t ask to go to Universal Studios. Karen and I chose it for them largely because of the new Harry Potter world that just opened. We have read only the first book to them and they have seen only the first movie, but I still expected them to be awed by walking through the castle at Hogwarts and the streets of Hogsmeade. How couldn’t they? Children the world over love Harry Potter. I knew they wouldn’t be able to go on every ride — Gavin isn’t tall enough and Celeste hasn’t graduated beyond small roller coasters — but I still figured they would enjoy it. I expected them to, if only because Karen and I enjoy it so much. But Celeste found the images in the movie that is part of the main new ride, Harry Potter and the Forbidden Journey, too scary and didn’t want to give it a second go. And Gavin didn’t like the sounds he heard (the voice of Hagrid, mainly) walking through the woods to ride the Flight of the Hippogriff, a small roller coaster perfect for young children. As a result, we could not fully enjoy the new world of Harry Potter. In fact, if it weren’t for the five or six attractions in Seuss Landing, a corner of the park revolving around the world created by Dr. Seuss, the whole trip would have just been an expensive jaunt to a hotel swimming pool in Florida. I don’t blame the children, of course, but my own expectations of them and how they would define a fun trip. As they grow older, I’ll need to keep my expectations in check to ensure I don’t look for either of them to solve the puzzle of the cosmos for their seventh-grade science project or hit that grand slam in the bottom of the ninth to win the game. Expecting that much can lead to disappointment, which they could interpret as me thinking they are a failure when nothing could be further from the truth. I’ll need to find the right balance between accepting too little and expecting too much, for in that sweet spot of parenthood grows well-adjusted children. But for now, I need to remember that they can have a blast by spending an hour drawing faces on balloons and chasing each other around the house with them. And that I don’t expect my cat to bark. This is a repost of a column that ran in The Gazette on Sept. 9, 2010. Obi died last year, and we adopted two other cats, Clover and Mario, neither of whom I expect to bark. Both Celeste and Gavin have also since seen all the Harry Potter movies (we skipped the scariest parts), and love them all. But we’re still not returning to Universal Studios. Turns out we’re a Disney World family. Karen and I always try to instill a sense of charity in our children. 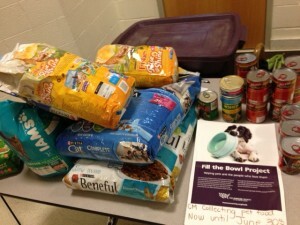 The pet food we collected at church on Sunday for the Fill the Bowl Project. We take them to buy school supplies in the fall for families who can’t afford to buy them for their children. We throw extra presents in the shopping cart at Christmas and they drop them in the Toys for Tots bin on our way out. They help us go through their old clothes to donate. And we bring food every month to church to give to the Greater Urbana Area Food Bank. But in all our efforts to help people, one need has remained unmet: their pets. Our 11-year-old daughter Celeste spearheaded an effort through Children’s Ministries at church to collect pet food for our local food bank. She thought of the idea on Take Our Daughters and Sons to Work Day in April. Karen brought Celeste and our 8-year-old son Gavin with her to work at The Humane Society of the United States. In addition to seeing Mommy in action at the office and learning about the Humane Society’s efforts to protect animals, they also stuffed information packets for one of Karen’s projects: Fill the Bowl. Hi, I’m Celeste. I wanted to do the Humane Society of the United States’ Fill the Bowl Project at my church. I want people to think about people who need help feeding their families and their pets. I wanted to do this because I don’t want animals to suffer from starvation. I want them to eat freely. I also did this because I love animals! This made me feel proud of myself for collecting so much pet food on the first day! I’m happy for pets eating and their pet owners smiling. Collect pet food for people who need to feed their pets. On Sunday, members of our church brought in enough food to fill the back of our car and we dropped it off at the food bank. The couple that runs it, Larry and Jo Ostby, were thankful for our efforts and mentioned how some of the families ask about pet food. I’m sure the pets that receive the food will be equally thankful to have a full bowl in front of them. The dogs would probably lavish Celeste with more slobbering kisses than she would care to receive, and the cats would, well, let’s not kid ourselves. They’re cats. They’d probably just walk away with their tales held high, which as any cat person knows is an exclamation point on their happiness. Me? I’m thankful that Celeste is beginning to understand the importance of helping people, even when they aren’t around to say thanks. If I’ve learned one thing in my nearly dozen years as a father, it’s that the best conversations I have with my children are spontaneous. This is especially true for touchy subjects, whether it’s personal safety or drugs and alcohol. I don’t know why this is, but both Celeste and Gavin pay better attention and are more engaged in the conversation when it happens naturally. It’s even better when they bring it up themselves, which Celeste did the other night. We had just finished dinner. Celeste was telling us about her day at school and how the teacher taught the fifth-graders a unit about drugs, the same one they have every year only the discussion becomes more detailed and advanced as she ages. Given that she’s entering middle school in the fall, I want her to be well aware of the dangers she’ll encounter and the intense peer pressure she’s about to face. I’m happy to say that Celeste paid attention to the unit, and is taking the lessons seriously. So far, she seems intent on avoiding drugs and alcohol, and hasn’t been exposed to either. Some children her age aren’t so lucky. According to the National Institute of Drug Abuse, many kids in America take their first hit of a joint or sip of alcohol not long after turning 12, which Celeste will be this fall. It pains me that not much has changed in the nearly 30 years since I faced these same pressures. I remember critical moments of my youth when I found myself at the crossroads of right and wrong. A soft internal voice often tried to steer me toward the right, but a din of teenage voices and vices sometimes drowned it out and pulled me to the left. My internal voice ultimately won, but I lost many childhood friendships along the way. One stuck out in my mind as I talked with Celeste about drugs, alcohol and the dangers of peer pressure. I warned her that even her best friends may one day choose drugs over her friendship, just as one of mine did long ago. He loved the high so much that he allowed it to destroy the kid he was before his first hit. His parents eventually found themselves at their wits’ end, and kicked him out of their home in a show of tough love. My mother agreed to take him in on one condition: No drugs. The arrangement didn’t last long. 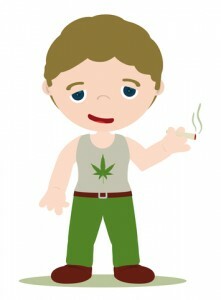 As bedtime approached one evening, he told me he was going to sneak out and smoke weed. I tried to talk him out of it, but he shut me down with little thought. I had a choice to make: allow him to sneak out, enable his drug use, and take advantage of my mother’s hospitality or tell my mom. I found myself facing the hardest and easiest decision of my life up to that point. I valued his friendship and didn’t want him to destroy his life, but nor would I enable his drug use. I ran upstairs to tell my mom. She followed me back down to see what was going on. “It’s time for me to go, Kay,” he said plainly. 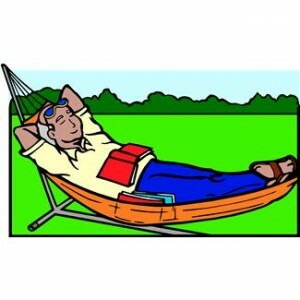 Most friendships die a slow, natural death as interests change or we age, and few of us ever remember the last breath. I remember that one with painful clarity. “It’s time for me to go, Kay.” He spoke the words with no emotion, as though the drugs dulled any feeling he ever felt. I can’t say the same for me. My anger exploded moments after he walked out the door. I repeatedly pounded the wall with my fist without feeling a pinprick’s worth of pain. We never hung out again, and I only ran into him accidentally a couple of times in the immediate years following that night. I have no idea where he is or how his life turned out. I do hope, however, that he bears no malice against me and understands my decision that night. He chose drugs over our friendship, and I chose to listen to that little voice inside me. It found a megaphone that night, and had no trouble drowning out the din from the pressures of drugs ever again. Celeste sat silently as I told her my story of that night. She said little if anything when I finished, but I hope she understood my main point: Even your best friend chooses drugs, you don’t have to make the same choice. I’m proud to say I made the right choice many times, but disappointed I can’t say every time. I can only pray that the wrong decisions I made three decades ago will guide me in helping my children make the right choices today. Peer pressure suffers from a bad rap. Oh, I’m not talking about the kind in which kids push their friends to do something harmful they might not otherwise do. That kind of peer pressure deserves all the scorn it gets, and then some. But kids pressuring their friends, either directly or indirectly, to do something they needlessly fear can make up for a parent’s shortcomings, or at least those that the dad behind these words can claim as his own. A recent day at our neighborhood pool in Urbana reminded me of this truth. My kids love spending a hot summer day in the water, but they aren’t the best swimmers no matter how hard I try to teach them. My 5-year-old son Gavin doesn’t like water in his eyes, so he won’t put his head underwater, let alone attempt any move resembling the doggie paddle. If water accidentally finds its way into his eyes, he screams as though it were acid. And while my 8-year-old daughter Celeste has no problem going underwater, she doesn’t actually swim. She’ll kick her feet and flail her arms around, but she doesn’t really go anywhere. A few feet, maybe, but Michael Phelps swims farther when he scratches his nose. She’s taken lessons two or three times, but it’s been a couple years and we have found excuses to not try again. As a result, Gavin is confined to playing in the shallow end of the pool or jumping into my arms and riding piggyback while I stand in about four feet of water. I don’t let him go beyond my reach, which bothers Celeste if it’s only the three of us and she has no one else with whom she can play. She wants me to give her as much attention as I give Gavin, but I can’t. I’m relieved when Celeste finds a friend to swim with because then I can make sure Gavin does not become a tragic summer statistic and she won’t feel left out. Part of me feels guilty they can’t swim better, because I remember when I was kid how much I loved swimming on long summer days in The Orchards’ neighborhood pool in Gaithersburg. From the moment the pool opened at 10 a.m. until it closed at 8 p.m., you could find me and my friends playing Sharks and Minnows, Marco Polo, or perfecting flips off the diving board. We were even known to play our share of cards — a game called Spit, even though it didn’t involve any saliva that I recall — during adult swim. We simply loved that pool, and my kids love theirs, but they have yet to enjoy it to the fullest because they don’t swim that well. One day not long ago, the three of us were at the pool for a couple of hours, and Celeste was growing tired of me paying so much attention to Gavin. We were about to leave when some friends and their children arrived — a welcome sight given that Celeste did not know anyone else at the pool that day. She immediately wanted to play with them, which was fine with me. But after a while, she wanted to follow them and their dad into the deep end, which I would not allow. To say she was not happy with me is akin to saying this summer in Frederick County has been a touch on the warm side. Celeste sat in silent thought for a few moments as her friends continued to swim in the deep end with their dad. “I want to take swimming lessons again,” she said softly, and I agreed. Her mood improved and we continued on. A short while later Gavin was jumping to me in the pool, but he was still determined to keep his head above water, as though he had just spent every penny in his piggy bank on a new hairdo. 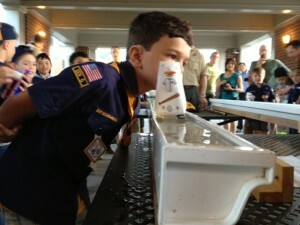 But then he saw one of his friends, who is about two years his junior, swimming around like he was trying to find Nemo. “OK, Daddy, I’m going to do it,” Gavin announced proudly as he stood on the edge of the pool watching his friend swim without a care. He jumped. I was too far away to catch him, so he sunk like a rock. I moved quickly to lift him up and braced myself for him to pop his head above water with an ear-splitting scream. I spent the next 20 minutes catching Gavin as he jumped to me in the pool, and his head went underwater every time without complaint. I can’t count the number of times I tried to persuade him to dunk his head underwater before that day, but I always failed. It just took an unintentional nudge from one of his younger friends, a peer pressure of sorts, to encourage him to do something he needlessly feared. I smiled, and realized that a similar unspoken pressure, or perhaps “drive” is a better word, that Celeste felt to swim with her friends also persuaded her to want to learn how to swim better. If only all peer pressure had such happy endings. This is a repost of a column that appeared in The Gazette on Aug. 26, 2010. Gavin is now 8, and is still learning how to swim. He doesn’t mind dipping his head below water, but holds his nose every time.